You see the dynamic all the time. One newspaper (or broadcaster) runs a story and, within hours, the rest of the media pick it up and repeat it, sometimes with their own spin, but with the basic facts unchecked. Thus, a core error gets repeated and repeated until it becomes part of the narrative, pulled out for ever more whenever the issue is raised, becoming part of the received wisdom, simply by dint of constant repetition. Discussing with one senior official a particularly egregious example of an error-ridden story which had spread through the system, in frustration he described the process as akin to journalists eating each others' turds. Graphic though that image might be, it is uncannily accurate. You see it in any newsroom, where the assembled hacks have televisions tuned to all the main news channels, they have their competitors' products on their desks, and their websites on screen, each imbibing and re-excreting the droppings of each other, in a constant, self-perpetuating cycle. There is an added dimension in the Westminster bubble, where the politicians pick up the choicest turds and produce their own, which are seized upon by the ravening hoards of political hacks, to reinforce the cycle. A classic example of the general dynamic comes with the Independent's story of the sailing the "Northeast passage". This has now been picked up by The Times and the Mail. Both repeat the elements of the story but the latter, in classic tabloid style, "adds a Union Jack" to it – on the assumption that the matter is of no interest to its readers unless there is a British dimension. Thus we get: "Melting ice cap opens up Northeast Passage to British ships", the lead paragraph telling us that: "The price of British imports from Asia could fall after two merchant ships completed an historic shortcut over the once ice-bound top of the world." Having planted the flag, the paper then goes on to re-excrete the Independent's droppings, asserting that, "They [the merchant ships] are the first commercial vessels to successfully travel between Asia and Europe using the Northeast Passage and the shipping lane could become a viable alternative to the established Suez Canal route during a six to eight-week window every summer." Amusingly, not once in its piece does the Mail mention that the ships which completed the "historic shortcut" were German. Although the paper is happy to deliver its own variety of turds, its editors presumably judged that this particular bit of information was too strong for its readers' stomachs. Nevertheless, the paper repeats without question the shipping company's claim – as retailed by The Independent - that it had saved £180,000 per vessel by using the route to sail from South Korea to Rotterdam. We are faithfully told that: "It is 3,500 miles and ten days shorter than the established 12,500-mile merchant ship journey, which goes through the South China Sea, the Indian Ocean, the Suez Canal and the Mediterranean." This is something I should have picked up in my critique of the Independent piece, as the claim is total garbage. The clue is actually in the piece, but I missed it on first reading. What we are told, in just one sentence, is: "The 12,000-tonne vessels' summer journey through the Northeast Passage was carried out with 3,500 tonnes of construction materials and parts for a Siberian power station on board." You have to go to the shipping company's website to flesh out this detail, where one finds that the destination of the ships was Siberia. 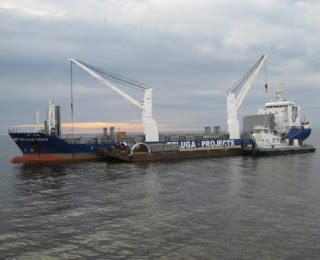 It was delivering heavy components of a power plant to the Russian Novyy Port (see map) which serves the settlement of Yamburg in Obskaya Guba (Ob' Bay), where the shipment was to be delivered by barge to the mouth of the River Ob. This does not stop turd-eater Tony Halpin, of The Times describing them as "two German container ships" and then referring to the "heavy merchant vessel Fraternity", unable - it seems - to understand the difference between "heavy" and "heavy lift". At 12,000 tons, heavy it ain't. Nevertheless, since the whole purpose of the ships' journey was to deliver cargo to this Siberian town, it defies imagination as to how the owners were actually saving money, compared with taking a different route. They took that route because they were obliged to take it. There was no realistic alternative. And as the ships required not one, but two icebreaker escorts – as we now learn – it is extremely hard to see how the route could save any money at all for normal commercial traffic. Turning to the Mail's assertion that, "The price of British imports from Asia could fall ... ", this is yet another fantasy. 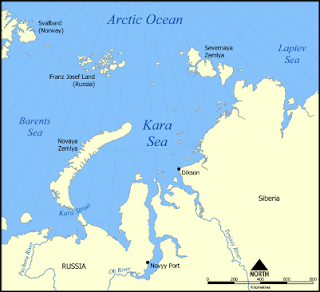 The massive container ships which ply the southern routes would not be suitable for the northern route, not least because the deep draughts would drastically limit their navigational flexibility in the shallows of the Kara and Laptev Seas, and the straits which shipping is forced to use. More particularly though, there is the issue of punctuality. Dock facilities for container ships have to be booked well in advance. Loading and unloading is scheduled incredibly tightly, with massive financial penalties for delays. With transit through the northern route determined by ice conditions and weather, it would not be possible to estimate passage duration even to within a few days. Thus, the costs of being forced to use smaller, less economic ships, the uncertainties in passage time, the cost of icebreaker escorts and the slower speed of transit (compared with the 25 knots of ocean-going ships) would far outweigh the savings accrued from the shorter route length. In short, the Mail story is garbage, a turd amongst turds, churned out by the never-ending legions of witless hacks whose sole purpose in life is to fill space, heedless of quality or accuracy of content. The point, of course, is that in this particular story, the fact-checking is relatively easy and the errors very obvious. In other stories, the errors are equally grave but less obvious and much harder to check. But an industry which is capable of producing the low-grade material that we have just seen is capable of anything. Nothing, but nothing, should be trusted. Just because journalists produce turds does not mean we have to eat them.